After the corner trusses and the window bucks are positioned and braced, the rest of the walls are framed with a Larsen Truss every 2 feet on centre. A window buck is also shown lying flat on the subfloor, ready to be lifted into place on another wall. The walls on this building were framed to a thickness of 12″ in order to provide an optimal amount of thermal insulation from the fibre (the straw and/or wood chips) and thermal mass (the clay soil). 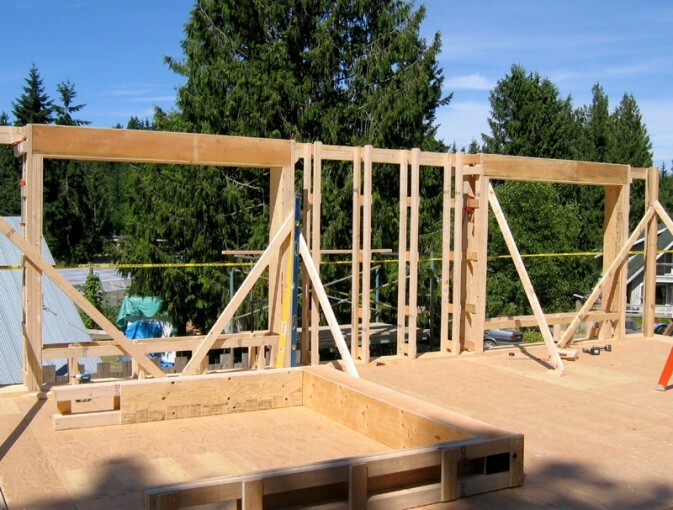 The Larsen Truss system significantly reduces thermal bridging in the wall, and this system can also be used with more conventional insulation, such as cellulose, to provide a much higher R-value. Tim took this photo at a clay/fibre building workshop taught by Robert Laporte. For more information, visit the EcoNest Building Company.